عندما تزور ملبورن, ستشعر أنك في بيتك في Punthill Apartment Hotels Manhattan الذي يقدم لك إقامة متميزة و خدمات عظيمة. يمكن من هنا للضيوف الاستمتاع بسهولة الوصول إلى كل ما تقدمه هذه المدينة النابضة بالحياة. سوف يعشق النزلاء موقع هذا الفندق، فهو قريب من أهم المعالم السياحية في المدينة كمثل Craft Victoria, جابرئيل بيزي, Dendy Kino Cinema . إن Punthill Apartment Hotels Manhattan حريص على توفير الراحة للنزلاء، فلا يوفر الموظفون جهداً في تقديم أفضل الخدمات وضمان حسن الاستقبال. يمكن الاستمتاع بمجموعة من الخدمات على أعلى المستويات في الفندق كمثل تخزين الأمتعة, واي فاي في المناطق العامة, صف السيارات, غرفة عائلية, خدمة التنظيف الجاف. بالإضافة لهذا,تتضمن كل غرف الضيوف مجموعة واسعة من وسائل الراحة . بعض الغرف توفر حتى إغلاق, تلفزيون بشاشة مسطحة, صوفا, مرآة, بياضات لإرضاء أكثر الضيوف تطلباً. يقدم الفندق مجموعة واسعة من وسائل الراحة المتنوعة، كمثل: مركز للياقة البدنية, سبا. مهما كانت دواعي سفرك فإن Punthill Apartment Hotels Manhattan هو خيار ممتاز لإقامتك في ملبورن. Great hotel. Staff were very friendly. Rooms were neat and all facilities in the room were great. Room was very clean and bed well made all except the empty Powerade bottle that was left under the bed which didn’t worry us at all. With that being the only let down it was a great place to stay. we spent good money booking this apartment for its location and luckily we weren't staying there much during the day as all you could here for several hours afternoon and morning was drilling and tile removal. Overall the quality of the apartment was acceptable however as there was construction going on the stairwell was filthy. We were given no indication this was occurring when booking or prior to arrival otherwise we would have stayed at the Sofitel across the road. Apparently this will be going on for some time as they are only renovating one bathroom at a time. Might pay to ask prior to booking if the works are still ongoing. location is perfect. Staff are nice and helpful. Room with a washing machine and a dryer. I'd stayed here before when I needed to be in Melbourne for more than a day or two. 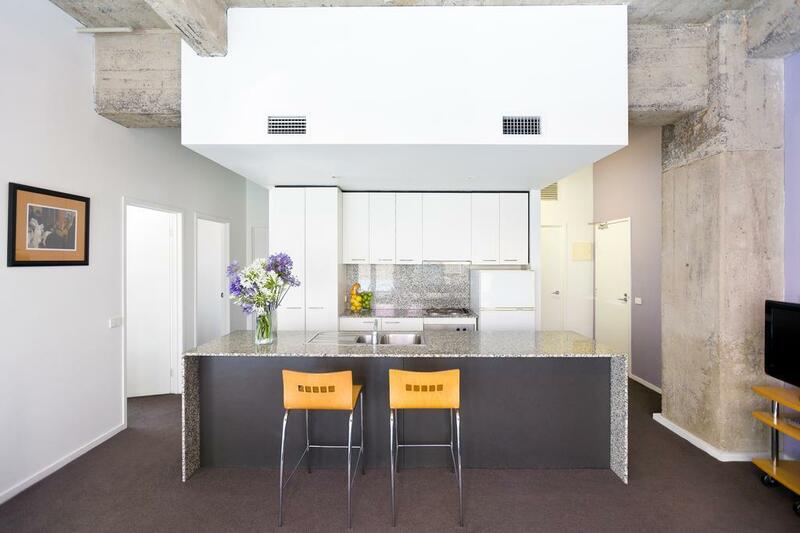 The loft-style one-bedroom apartment is incredibly convenient for just about everything, with most things either a walk or easy tram ride away. The good size and well-equipped kitchen enables you to self-cater or go to one of the many eating places nearby. I found it as comfortable, quiet and relaxing as on my previous stay several years ago. I'll use it again in the same situation. Travelling with friends, this hotel provided good value with its comfortable interiors, mod-cons and convenient location. Single beds in the one room were a bit short though. Accommodation was also well-maintained. Had a one bedroom apartment on the sixth floor on a Saturday night. Very clean and comfortable. Was not bothered by street noise at all. Parking discount available for next door. Would definitely stay again. Location: Take tram to last stop 8 along Flinder's St. about 3 minutes' walk from the stop. Quiet location, not too bad during the day time but at night it could be really quiet; Room on level 2 faces the carpark, really close up..too close in fact. Room: Living room space was good; The beds were not too bad, but they had the extra bed just next to the exit..quite a strange arrangement; Plates and cups were placed in cupboards not reachable by short people like us; If you need grocery, this may not be the right choice; Amenities in room includes washing machine and dryer, which is very convenient. Close to everything. Great size apartment for long weekend. This is my second visit and I'll be back. I was on my honeymoon and everything was just perfect! very spacious and very convenient as it had everything! laundry machine,dryer...etc! very friendly staff as well! I would love to stay here again in the future! The temp setting was uncomfortable! Finding our room was difficult as you had to go out the back door and down stairs. A map of the properties configuration would have helped as we were there after office hours. We got in the door and then had go out to ring for more information. Checked in for an overnight stay only. Staff were amazing - very friendly & helpful. Apartment was excellent, couldn't have been better. Close to many great eateries & other venues. Already planning to stay here on my next visit to Melbourne. 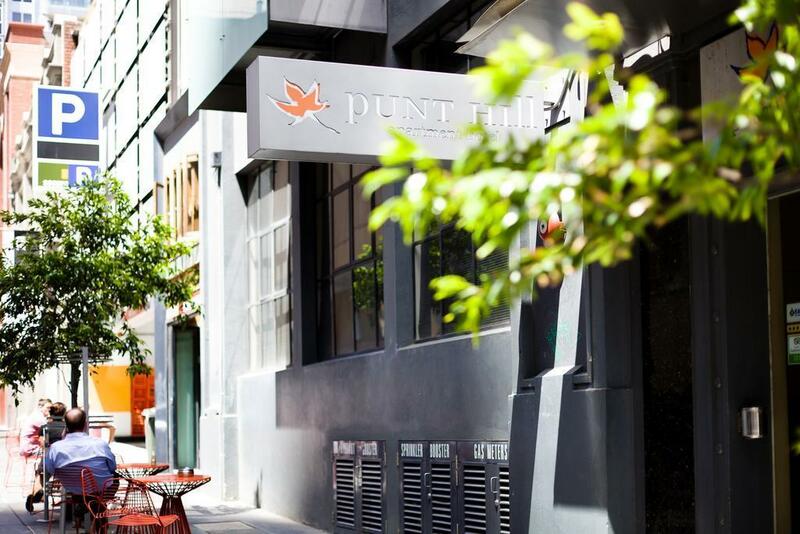 Our stay at Punthill Manhattan 57 Flinders Lane was excellent. The three bedroom apartment was modern, cosy and very spacious. Enough to accommodate our big travelling group of 6 adults. The amenities provided were complete and satisfactory. Wasn't sure whether parking for car rental was provided or not, but we rented a spot for the public parking space in the opposite building. The location of the hotel was also quite near to the tram stop and there is a nice coffee shop nearby that opens in the morning. The staff at the reception was helpful. On the first day, we arrived late and the reception office was closed, luckily the late-check in instructions were clear and we managed to get inside easily. The hotel staff was also very kind in allowing us to leave our bags at the hotel after checking out in the morning since our flight was in the late evening. And they also helped us to book a taxi to the airport. We are thankful for that. i stayed there for one night. luckily i was stay only a night, poor in room decoration!! you can see the bricks without any paint. sorry to say, i really feel uneasy with it. it is so different with the picture. in the picture it looks nice, but when you stay in... oh my god, you will feel like you stay in car park. terrible feeling. 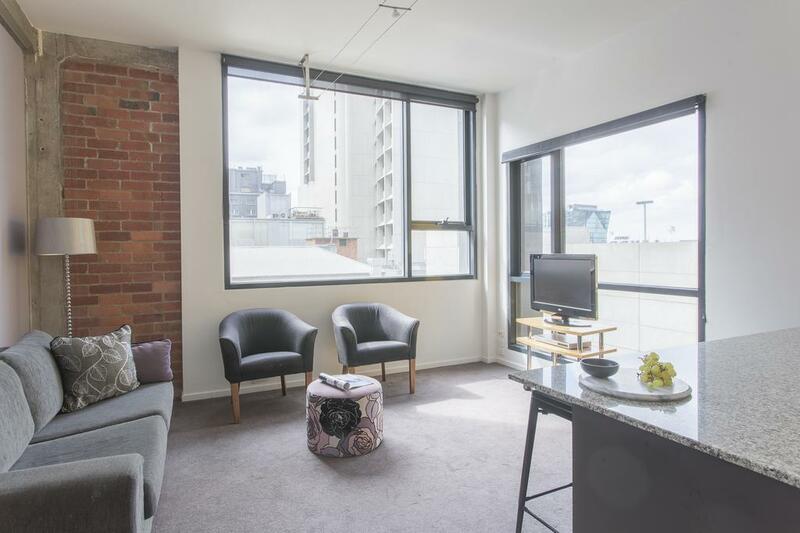 I would recommend these apartments to anyone visiting Melbourne. The staff were so helpful with everything, the position was excellent, within walking distance of so many things. Trams, trains and everything the city has to offer. We stayed in a 1 bedroom apartment which was big in comparison to many others we have stayed in. The bed and pillows were also extremely comfortable. Our short stay was very enjoyable and entertaining as the apartments are close to some magnificent restaurants and cafés, high quality shops, movie theatre, sporting precinct and transport. We would thoroughly recommend the Punthill Apartment Hotel Manhattan as a place to stay for couples, families and small groups of friends. My husband and I selected the Punthill Apartment as it was close to the theater we were seeing a show at. We were overwhelmed by the quality and size of the room and were realised for once that transport and venues were in close proximity as advertised, we were in no way mislead and were very happy with our stay. We would definitely stay there again. We took our one year old to Melbourne to celebrate his birthday and to attend a gig at the Sidney Myer Music Bowl. 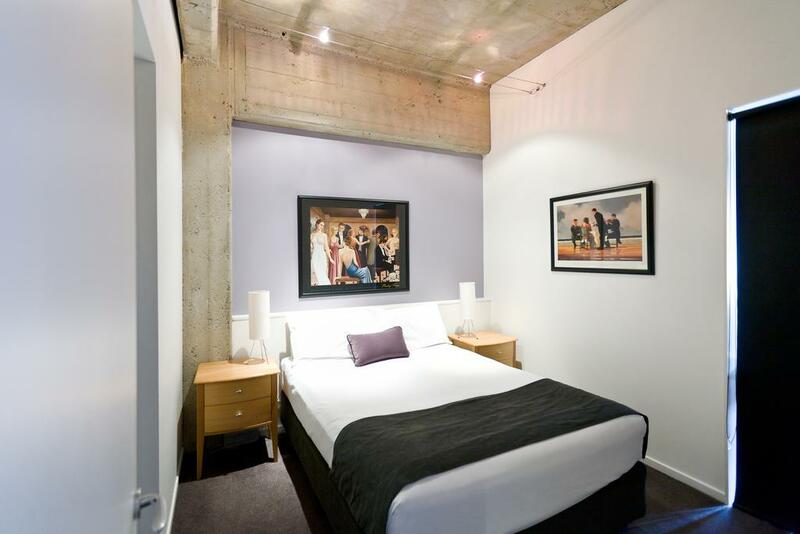 The apartments are located in a funky part of Melbourne which is five minutes walk to Swanston Street (and the centre of Melbourne) and to Federation Square. Amazing restaurants and bars within 1 min walk and very friendly check-in staff. The room was beaten up slightly but it suited our purposes perfectly - had a bath for our child - and was excellent value for money. Well worth the stay. It's was brilliant for its location for a first-time visitor to Melbourne. Best situated on a street where you can find the best restaurants and bars, and also great proximity to the tram lines that will take you almost anywhere in town. Love it's walking distance to the museums, and also the eating places situated at the casino. All in all — it was a fantastic experience. Minor down point of it, you have to pay for wifi. Though almost weird to think of, when most hotels (big or small) or even rented apartments provide free wifi. Love Punthill Manhattan. 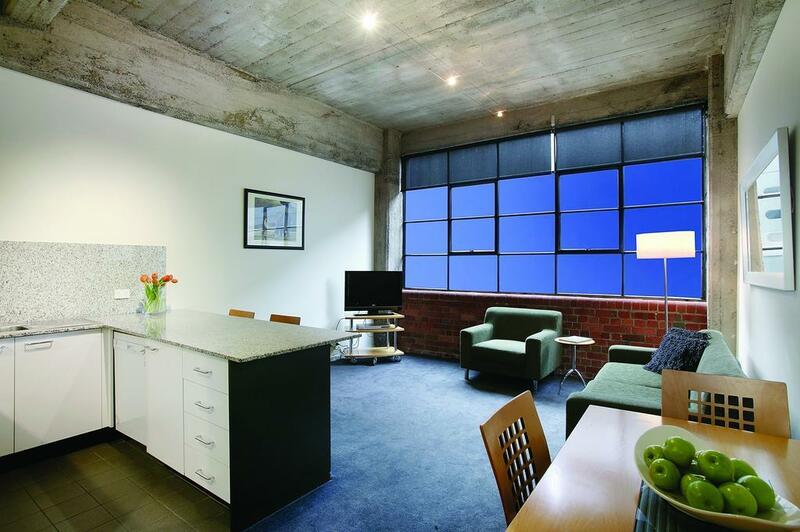 Have stayed before and love the location,room size and the warehouse style of rooms with high ceilings. The rooms are a generous size (hard to find in Melb at a decent price) and come equipped with everything you need in a self-catering apartment. Have no hesitation in recommending Punthill Manhattan to anyone.